In the tradition of creating homestyle, comforting meals with whatever leftovers one might have in the freezer and pantry, I created a rustic chicken pot pie recipe that I’d love to share with you. It’s easily created using frozen vegetables, a box of pre-made pie crusts, and some pre-cooked chicken. I made a velvety, buttery gravy first, which always reminds me of home. When I was growing up, Sunday was the one day we were guaranteed to have a meal that included gravy. Mama made a mean chicken gravy; so good that in our household, it was the thing you compared other things to, to express how good they were. “This peach cobbler is as good as chicken gravy!” “This biscuit is so good, tastes like chicken gravy,” and so on. Silly, but it was one of those family things. Every family has their inside jokes, don’t they? It’s a fond memory. Bake for 30-35 minutes, then dig in! 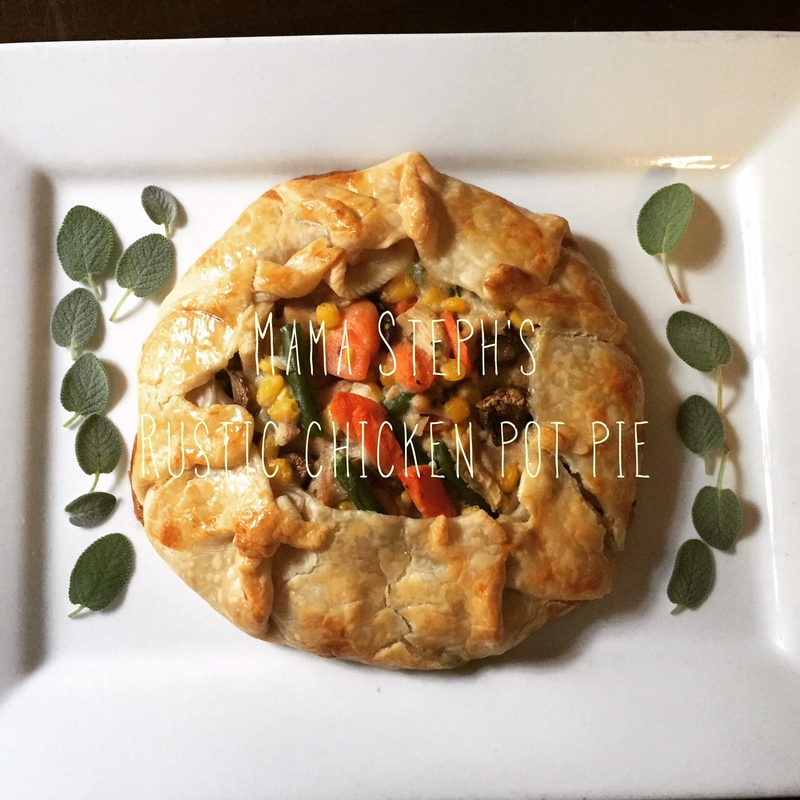 I saved three cups of thigh meat for this chicken pot pie, but it would be great to use four cups, to increase the protein. I used extra vegetables, instead, since I was short a bit of meat. This recipe makes enough for two small or one large pie. If you would like one larger one, stack the two unrolled crusts and roll them together with a rolling pin, stretching the size out to accommodate a good amount of filling. Just don’t get it so thin you can see through it. Here’s the recipe for my easy, rustic (that means it doesn’t have to be perfect, which covers a multitude of sins!) chicken pot pie. Which is really a galette but let’s just go with it. 1. Preheat oven to 375 degrees F. Line one large or two medium baking sheets with parchment paper. 2. Carefully roll pie crusts out flat on the parchment to make two smaller pies, or stack the crusts and roll out to make one large pie. 3. In a large frying pan, melt butter over medium heat. Add the flour, and cook together for two minutes, stirring continuously. 4. Add chicken broth, and whisk until smooth and silky. Cook for three or four minutes, simmering until somewhat thickened. Taste, and sprinkle with about 1/2 tsp salt at a time. Do not oversalt the gravy, or you’ll need to start over. 5. When thickened and salted appropriately, take off heat. In a small bowl containing the milk, add a few tablespoons of gravy, to help temper the milk so it won’t curdle when added to the hot gravy. Stir it well, then add it to the pan. Whisk together, and taste. 6. In a large mixing bowl, combine all the vegetables, the sage, the chicken and the gravy. Stir gently until uniformly coated. 7. Pile the mixture in the center of your crusts, leaving a two or three inch border all around, then begin gently folding up the sides, crimping every several inches, not stressing out over perfection; you’re just building walls to hold in the delicious filling. Remember, RUSTIC. 8. Place in hot oven, and bake for 30 to 35 minutes, until crust is golden brown. Since I had two, I rotated their positions after 15 minutes, then baked for 20 more. 9. Allow to cool on sheet for 10 minutes, then slide paper off onto cooling rack. Serve warm. I allowed the vegetables to thaw out for fifteen minutes or so while I was doing other prep; then I rinsed and drained them well. This was to ensure a non-soggy crust. You may brush your crust with an egg wash just before baking (one yolk with a tablespoon of milk or cream, whisked together) if you’d like it to be golden and shiny when done. If you would like to freeze, after completely cooling, double-wrap in foil, then place flat into the freezer. Enjoy this for your simple Sunday supper, or anytime you would like a non-fussy and delicious meal that your family will likely ask for again and again. What’s your go-to Sunday supper? Tell me in the comments below; I would love some new ideas to try at our house. By the way, you might also like this blueberry-peach galette for dessert, or try my chicken and dumplings if you’re in the mood for even more comfort food. This looks amazing! I love chicken pot pie. OH Steph, This is a to die for comfort meal. I love the rustic part. And the fact that you can adjust the meat/veggies to what you have on hand……or what you want in it at the time……Wonderful and something we both love.